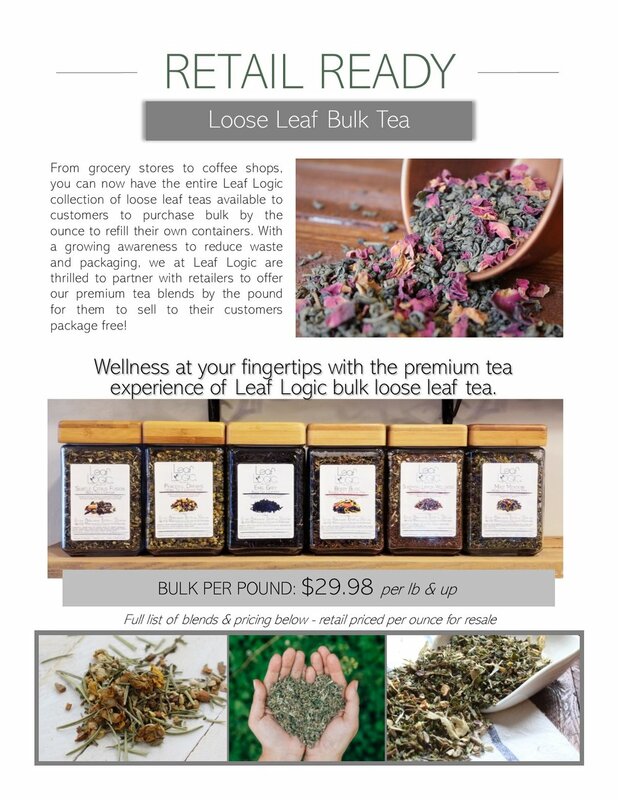 Interested in selling or serving Leaf Logic tea blends? At Leaf Logic, we offer a variety of wholesale opportunities, from multiple shelf ready display options that fit right in your store, to supplies and training to serve Leaf Logic in your cafe or restaurant. Serve premium loose leaf tea with our hot tea service station and tear and brew food service iced tea pouches. We also work closely with a local coffee shop to provide premium coffee and tea catered at your event. Whatever your tea need is, we have a solution for you. Contact us at the form below to receive a call from one of our Leaf Logic team members! Thank you! One of our Leaf Logic team members will be in touch with you shortly. RETAIL LOOSE LEAF REFILLABLE TEA JARS: From boutiques to grocery stores, Leaf Logic's retail ready packaging stands out on your shelf and offers excellent profit margins for the minimal space. We have unique packaging to present your customers with a delightful loose leaf tea experience that will bring them back time after time to stock their tea cabinet. All 33 of the tea blends from the Leaf Logic Collection are available in retail packaging. Jars are sold at Wholesale by 6 packs and are carefully packed in fully compostable boxes (the boxes, the ink, and the tape are fully compostable!). Browse the tea selection by clicking here. RETAIL LOOSE LEAF BULK: From grocery stores to coffee shops, you can now have the entire Leaf Logic collection of loose leaf teas available to customers to purchase bulk. With a growing awareness to reduce waste and packaging, we at Leaf Logic are thrilled to partner with retailers to offer our premium tea blends by the pound for them to sell to their customers package free. This setup pairs very well with our refillable jars because customers can bring in their jar and refill at your bulk refill station. FOOD SERVICE ICED TEA: Leaf Logic offers 2 options for premium iced tea service. BLACK ICED TEA and elegant HIBISCUS ICED TEA bring a smile to your guests faces as they are presented with a delightful tea experience. Whether you are a small cafe or coffee shop or a large restaurant, we help customize a unique option for brewing and serving your iced tea with unique recipes and helpful tips. Our tear and brew pouches are pre-portioned with the perfect amount of tea to accommodate a 3 gallon iced tea brewing machine to save you the hassle of weighing each time you brew a batch of tea. FOOD SERVICE HOT SACHETS: Our top 4 tea blends are now available in pre-portioned single serving tea sachets. Cottage Breakfast rich and robust breakfast tea blend, Sencha Mint refreshing green tea and invigorating peppermint, Hibiscus Twist tangy-tart and fruity with a delicate touch of spearmint, and Kansas Sunset Chai rich cinnamon and clove, warming cardamon and ginger and sweet anise and fennel for a delightful caffeine free chai! HOT LOOSE LEAF TEA DISPLAY: The Cozy Leaf premium hot tea service stations are designed to hold as many as 1,000 servings of hot tea. Saving you space from all the back stock of bagged tea cluttering up your stock room. Offer your customers a unique tea experience and let us help customize the perfect set of blends for your cafe or restaurant. With custom signage for Cozy Leaf TO GO (for the guests on the move) and Cozy Leaf TO STAY (for the guests who want to sit and spend some time). All 33 of the tea blends from the Cozy Leaf Collection are available for bulk by the pound purchase. Browse the tea selection by clicking here. For more information and a detailed Wholesale Catalog, contact us today!